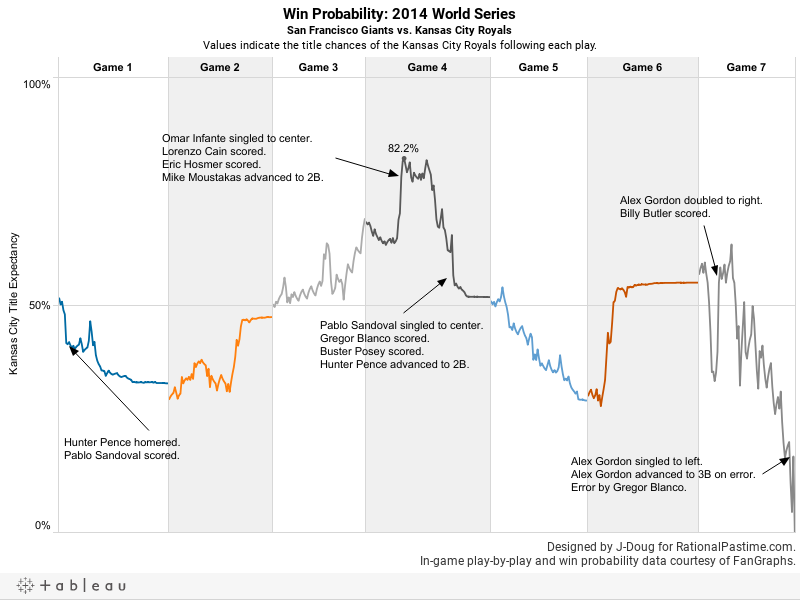 Tom Tango calls Win Probability Added the ultimate "story stat." By combining FanGraphs' WPA and my World Series Projections, I aim to depict and uncover the stories of the 2014 World Series in the same way. We knew that Madison Bumgarner was absolutely dominant. Did you know exactly how dominant he really was? How about how close the Royals actually came to winning it all (either in Game 7 or overall)? What were the most impactful plays of the Series? How much did your favorite player contribute to the San Francisco Giants winning it all? Check out the answers to these and other questions in the interactive chart below the jump. The Kansas City Royals hit their high water mark in the bottom of the third inning of Game 4, when Jean Machi walked Jarrod Dyson to load the bases with two outs, the San Francisco Giants trailing 4-1. At this moment, KC enjoyed an 82% chance of winning it all. The next batter, Jason Vargas, took strike three, ending the inning. The Royals would never again enjoy such short odds of winning it all in 2014. 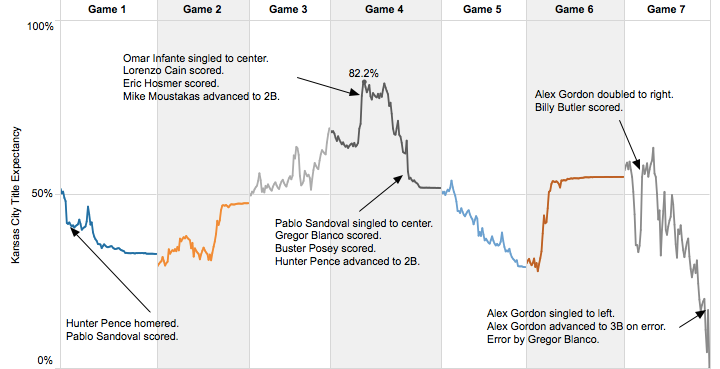 The San Francisco Giants wouldn't permanently exceed the 50% threshold until the top of the fifth inning of Game 7. With the Royals trailing by a run, Madison Bumgarner took the mound and promptly allowed a single to Omar Infante. The traditional-minded Ned Yost then ordered Alcides Escobar to sacrifice Infante to second. The bunt cost the Royals 3% of their World Series Expectancy, plunging them below the 50/50 mark for the remainder of the game, series and season. The best and worst offensive contributors to their team's World Series chances were both Royals. The Royals increased their odds by a net 28% with Alex Gordon at the plate, whereas their odds decreased by 26% with Salvador Perez at bat. Heading into the final at bat of the series, Sally's WSPA was a still dismal (but not nearly as heartbreaking) -9%. The biggest Giants contributor was Pablo Sandoval, with nearly 19% WSPA. At -11.5%, Joe Panik was the Anti-Panda. Oh, Madison Bumgarner? His WSPA was a humble 91% (!!!!!). Without question the MVP, he dwarfed 2013 WSPA leader David Ortiz (37%). The biggest play of the series was, somewhat obviously, Salvador Perez's series-ending foul out with Alex Gordon on third with two outs in the bottom of the ninth inning of Game 7. Game 7 being an elimination game for both squads, it's not surprising that of the ten most consequential plays, eight occurred in the final game. The most important non-Game 7 play was Pablo Sandoval's two-RBI single of Finnegan in the bottom of the sixth inning of Game 4. It's probably not all that common for a top play to occur in Game 1 in such a close series, but Hunter Pence's two-run homer off James Shields in the top of the first inning ranks 17th overall. Click here to view the visualization in wide screen.